CSIRO’s solar air conditioning system now sits on top of a major shopping center in Australia, and it is saving energy by using heat from the sun to cool the air in the center. 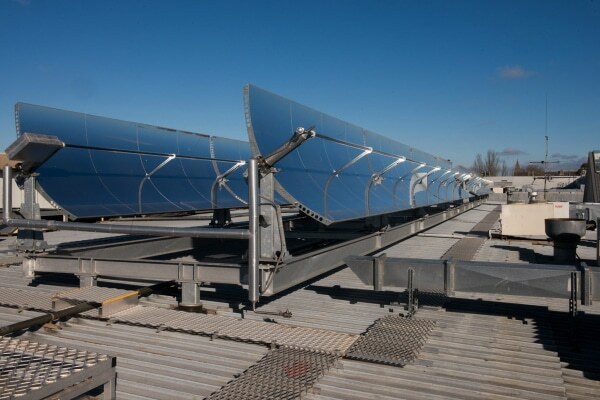 The system uses concentrating solar thermal technology to produce heat energy used to power the air conditioning system. It is a “closed-loop” air conditioner, meaning it heats and cools air within the building without introducing any external air into the system, with a pair of “desiccant” (drying) wheels acting as dehumidifiers to remove moisture from the air. These desiccant wheels operate at separate temperatures; the high-temperature wheel uses the captured solar energy for regeneration of the low temperature wheel, which operates without any external heat at all. The air conditioning system uses trough collectors to capture solar heat of around 150 to 200° C (302 to 392° F) and then store it in a 2,000-liter (528-US gal) thermal oil tank. Utilizing a heat cascading design, heat from the tank is used to heat the center’s ambient air in the winter and power an indirect evaporative cooler to cool the center in summer. The roof space required for the solar air-conditioning technology can be 40 percent less than a traditional single-stage desiccant system. CSIRO Energy Director Peter Mayfield is extremely pleased with the early results. “CSIRO’s energy research is driving down costs of renewable technologies, accelerating the transition to a lower-emissions future,” Dr Mayfield said. The project was partially funded through a grant from the Australian Renewable Energy Agency (ARENA). 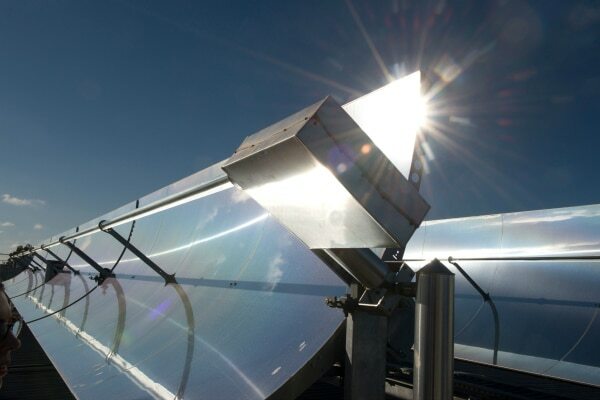 The system “has the potential to further improve the efficiency of solar thermal energy systems and storage to provide clean and reliable heating and cooling in commercial buildings,” Mr Ivor Frischknecht, CEO of ARENA, said. CSIRO will continue to assess and monitor the technology for the next 12 months to establish its long-term capabilities in commercial operations. Solar heat-driven desiccant air conditioning systems can provide humidity controlled fresh air into the buildings and are expected to significantly reduce HVAC electricity usage for commercial buildings.